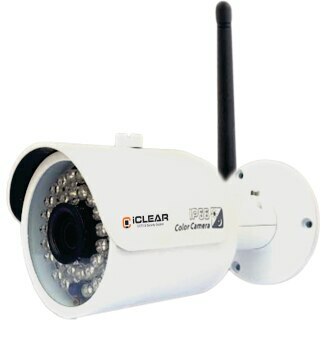 Wireless cctv camera (iCLEAR CCTV CAMERA) After you have an idea of where you want to install the cameras, you’ll need to know how many cameras the system will be able to handle. If you want one by the front door, garage, back door, and shed, you’ll want to make sure the system can handle at least four cameras. If you’re considering expanding in the future, make sure you purchase one with additional channels. All the systems in this article include four cameras but have eight channels, so you can add cameras on as you see fit. Wireless CCTV CAMERA H.264/264+/265/265+ ICL- IP NK 36R With 2.0 MP Field of vision - 360 degree. Lighting - 3w white led. Sensibility - 0.2 lux@f2(color)/0.2 lux@f2(b/w). Day/night - auto IR cut filter. video code - h.265. Frame rate - 25 EPS. Resolution - 1080p. Audio - AA/G.711, twoway voice inter come. Wifi standard - IEEE802.11b/G/N. Frequency - 2.4 GHZ. Power inter face - E27. Storage - TF Micro SD CARD upto 64 GB. Power supply - 1-140V (AC). Application - icsee pro , xmeye. size - D= 80mm , h= 137.8mm Wireless cctv camera, Wireless cctv camera manufacturers, Wireless cctv camera suppliers, Wireless cctv camera manufacturers in Gujarat, Wireless cctv camera suppliers in Patna, Wireless cctv camera in Bihar. Wireless cctv camera in Assam.